This ring is simple yet lovely. This was just my style, I love the braided wedding ring because a three strand cord isn't easily broken. It reps God, him and me in the order that God set. I picked it out it just helps that it wasn't costly. Show of your elegant style with this gorgeous braided ring from Miadora. Beautifully crafted from sterling silver, the ring features a woven top, lined with diamond accents and sterling silver beaded detailing. 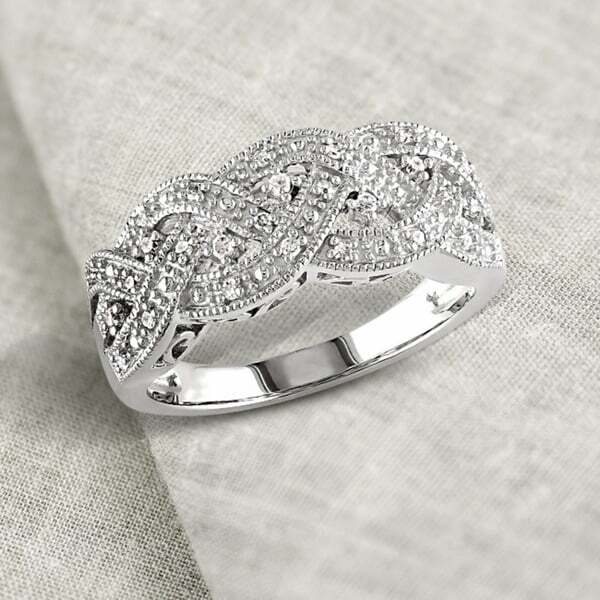 Milgrain edging and swirling lines of filigree on the undercarriage complete the elegant appeal of this beautiful ring. I purchased this to use as a substitute wedding band on occasion. Based on the picture and rave reviews, I was excited to receive it yesterday. Upon opening the box, though, I was surprised to see how "dull" this ring looked. 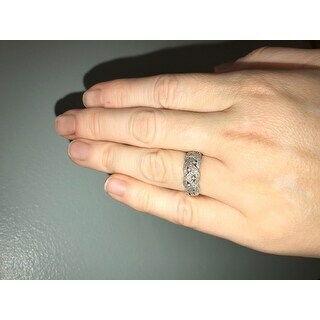 The band portion is a beautiful sterling silver but the top of the band, with the "diamonds," has a dull, matte-like finish which next to the shiny silver looks like it doesn't even belong on this ring. I'm very disappointed and am returning this. 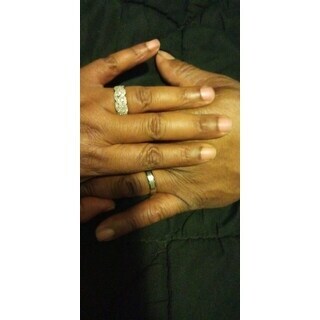 I received this ring today and am thrilled. If you are looking for a ring that has a lot of sparkle this may not be the ring for you. If you are looking for a beautiful ring to wear everyday that goes with everything and you appreciate intricate work then this ring is for you. It is timeless and has an antique look to it. The silver beading is pretty amazing for how tiny but detailed it is.It lays pretty flat and doesn't get caught on things. There is sparkle but not as much as in other types of rings. You can also wear another band or solitary stone with this but I sure wouldn't want to take anything away from this beauty. The band part of the ring is highly polished sterling silver. 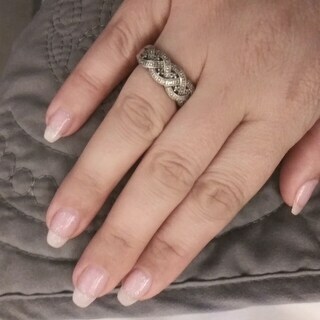 Your skin does not rub on the top pretty part of this ring but on the smooth silver band. It was very comfortable from the moment I put it on. The detail on the side of the ring is also beautiful and adds to the antique look and design. My mom bought this for me and to me it represents our 2 lives intertwining and is very special. I'm in love with this ring and can't quit looking at my hand. Miadora Sterling Silver 1/8ct TDW Diamond Braided Ring is just beautiful. First of all, it took almost two weeks to receive this ring, which is annoying because I had always heard about what great shipping overstock has. Anyway, the ring is very nice. It actually looks exactly like the picture. I was hoping it would be a little bit sparklier, but it is still a very pretty ring. Interesting design and it's a nice wide band. The diamonds are pretty low quality and cloudy, but honestly that is what I would expect from a ring with such a good price! Overall I like it. This Miadora Sterling Silver 1/8 ct TDW ring is pretry, but not my favorite ring. It’s kind of big on my finger and doesn’t really look very impressive. I wish that it were smaller and shinier and in fact I never wear it. I even forgot that it has diamonds in it until promoted to do this review. I Bought This Ring to Wear At Work Because i Don't Want To Destroy My Actual Wedding Set. It is A Pretty Design And Low profile On The Finger So I Won't Catch It On Stuff. i Like It For ThE price and Didn't Expect High Quality Diamonds And I Figured Because They Are So Small It Wouldn't Matter If They Were A Little Discolored And Cloudy. These Diamonds Are Pure Yellow And completely cloudy With No Shine. Absolutely Nothing LIke The Picture. If I Had Known That I Would Have Rather Gotten A CZ ring. Other Than That I Like It. The Sterling Silver Is Wonderful And Has Held Up To My Hands On Work. Not Bad FOr The Price And Do Not Regret My Purchase. I am very pleased with this ring. It looks as if I paid much more than I did. 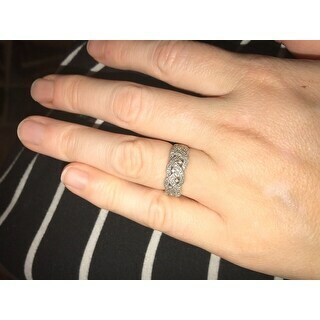 I purchased it because my wedding band is too big due to weight loss. Now I that I have lost more weight, this ring is too big, and I am seriously considering buying it again in a smaller size. It is a very pretty ring. I examine it every day to make sure no stones have fallen out, and none have. I am not a shiny things kind of girl. I didn't want gold and I particular didn't care if I had diamonds. I looked for a long time to find a ring to compliment my antique style silver teal sapphire engagement ring. I happened across this.. the side detail matched y engagement ring exactly.. i was concerned due to the other reviews if it would look dull... it doesn't!! Its brilliant and not too flashy... it glistens in a way that says yes you can see it.. but its not obnoxious and it seems to be sturdy enough to wear at all time. I am stoked!! It's gorgeous and I am married!! This is a pretty little piece, very tiny diamonds but sparkles in the sunlight. I bought this as a casual alternative to wearing my larger diamond and love the elegance of this ring. Notice the filigree on the side of the ring that makes it stand a little higher on the ring and look more expensive. It's got a low profile setting so it won't snag clothing. I'm very happy with my purchase, especially for the price. This was my first o.co purchase and I'm sure I'll be back! I am a picky person but totally love this ring! My boyfriend wanted me to find a ring I could wear on an everyday basis. I am a very indesisive person and even though I looked at many sites online and jewelry stores in the mall, I couldn't find one that clicked. I saw this ring on O.co and fell in love with it right when I saw it. The price also made me really happy. The only thing I was afraid of after I ordered it was the ring being too thick, but I found that its really not bad once I started wearing it. I love the swirls and I like the way it has a lot of little diamonds which lets the ring sparkle as a whole. I suggest this ring to anyone who loves it from the picture, because it looks just like that in person. I like this style ring but it just did not have any sparkle to it. The diamonds are very dull. 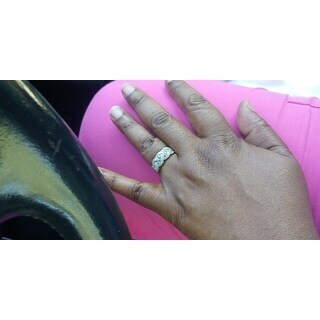 this is a very pretty ring,a little chunky in person,i have small fingers. one of the diamonds fell out,not the only one this has happened to. 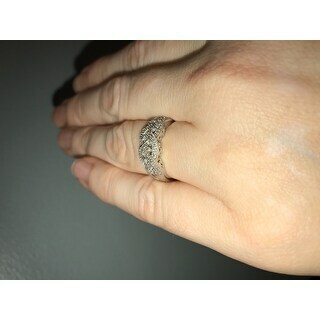 never got it resolved as i never got the the shipping labels i was supposed to for repair on this and another ring i purchased.i would like it better if it were repaired as it it a very pretty ring. i will probably purchase from overstock again since they actually don't make the rings but i would like to have this fixed. The ring came early and it was very beautiful and the quality of the ring was excellent. I love this ring. It looks simple and vintage. It has just enough sparkle. I am wearing this as a wedding ring/ anniversary band(we just hit 20 years!) The people giving bad reviews are expecting a lot out of a ring this inexpensive. I think it’s beautiful. Stunning. This ring is very easy to wear, doesn't snag on any thing. I absolutely love this ring and would recommend it to any one. 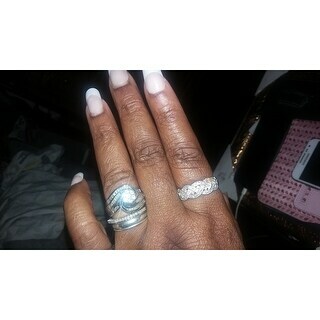 I love this ring it looks like white gold very sparkly but not overwhelming. Can use when you dress up or as an everyday ring. Great substitute in place of an expensive wedding band. Absolutely beautiful and more than mst our expectations! I had been looking for something that wasn’t juvenile looking yet looked like we spent thousands without breaking the bank. I like the ring and the fit was perfect. Was expecting a little more sparkle. Absolutely BEAUTIFUL! Husband purchased the ring as a gift for our anniversary- it is more beautiful in person than in pictures. I have received many complaints on it. Love it! Very pretty! I get many compliments. Looks exactly like the picture & is comfortable to wear daily. I love this ring. I bought it as an 10 year anniversary ring. I wear it everyday. It is a little bulky but over time it fit itself to my fingers well. I wish it would have kept its sparkly shine more. I clean it with sparkle sparkle and it looks nice but not that new mirror like finish. "only ring 11- 12 sizes"
Sizes can be selected under the 'Options' drop down menu. I really love the design it's basic but elegant . "Is this a certified diamond collection, the miadora?" Hi jleigh, Miadora is a brand name not a diamond collection. The diamonds are certified, just not part of a collection. Thanks for shopping with us! Sherri R.